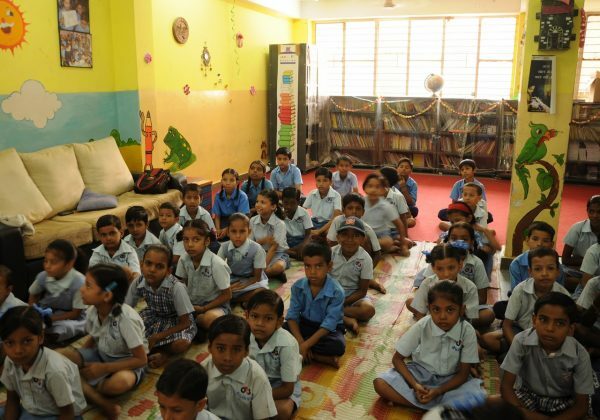 Located in Sangam Vihar, Delhi, the HOPE foundation G4S Shiksha School’s first batch of students comprised of 121 children who were taught in batches of 30 in a tiny rented room. The children aged 5 to 16 years lived in and around Sangam Vihar – some of them had dropped out of school and most had never been to school before. There are about 120 private schools in the area but their high fees make them unaffordable for the parents of our students, who earn minimal wages as rag pickers, rickshaw pullers, vegetable vendors, tailors and construction workers. The fee at our school is about 20 times less. The lone government school here is about one and a half kilometers away, making it difficult for young children to walk to school. Sangam Vihar is densely populated with narrow arterial streets clogged with traffic. In comparison, G4S Shiksha School is about a 10-minute walk from home for our students. In 2010, G4S (Group 4 Securicor) came on board as our partner and we moved Kindergarten and 1st grade to the present three-storied building. We initially occupied only the basement and the ground floor. Over time, we rented the upper two floors as well. By 2012, we moved the entire school here. At present, we teach Kindergarten to 5th grade, after which, we help students with admission to other schools. We help parents fill in the forms and accompany them to the new school. We also try to find sponsors among HOPE foundation’s partners. We have a scholarship program of Rs 50,000 a year for about 10 of our best performing students to study at Amrita Public School in Sangam Vihar. About 20-25 students pass out from 5th grade every year. We have an after-school program for our former students to help them with their schoolwork and also cope with the environment at their new school. Every year, about 100 students and young professionals from organizations such as The American Embassy School, the Goenka schools and Accenture volunteer at the school – teaching and conducting fun games, activities and outings for the children. Till August 2014, 11,000 children had enrolled with us. We get 50 to 100 new admission applications every year, of which we are equipped to take in about 30. We give preference to children who cannot afford to study elsewhere as well as to children who have siblings already enrolled here.